A quick and easy cake to make for an every day dessert or to serve for a festive occasion such as Canada Day. Top each slice with whipped cream or serve with vanilla ice cream. Arrange peach slices on bottom of a greased 1.5 L (9-inch) round cake pan. 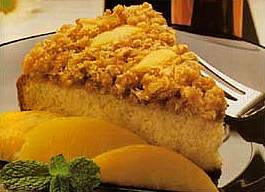 Combine butter, sugar and Harvest Crunch; sprinkle evenly over peach slices. Preheat oven to 180 degrees C (350 degrees F). Stir together in a bowl flour, sugar, baking powder and salt. Add milk, oil, eggs and vanilla. Beat until smooth, about one minute. Batter will be thick. Spread batter evenly over peach layer. Bake in preheated oven 45 to 50 minutes. Invert pan immediately onto serving plate; remove pan. Serve warm with sweetened whipped cream if desired.